Goat Yoga: Should You Try It? I’m in a beautiful mowed field in Triangle pose, gazing at a field of yellow flowers when a goat bumps into my leg. I smile, pet the goat, regain my balance, and flow into Warrior I. I am doing yoga with goats. I had heard about goat yoga and thought it sounded kind of silly, but also fun. Who doesn’t love adorable goats? When I saw it was offered as a pre-conference tour for Travel Bloggers Exchange (TBEX) conference in Finger Lakes I decided to sign up. 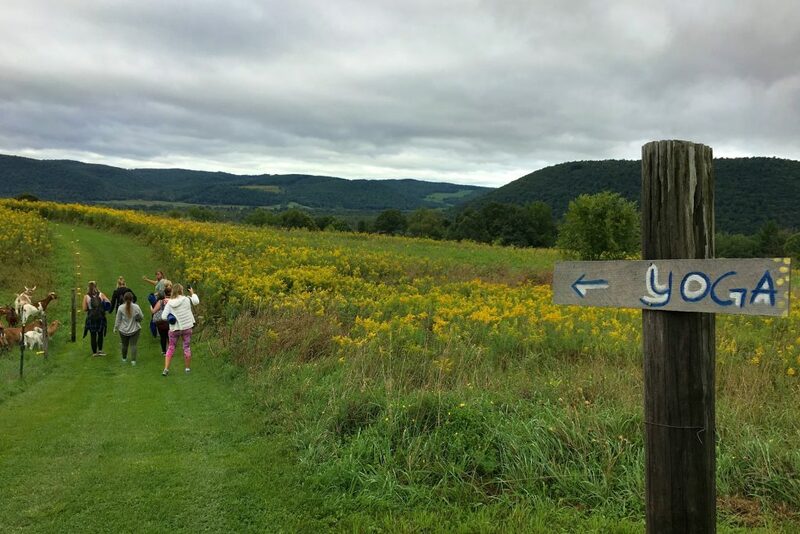 My group of ten goat-yoga-wannabes were shuttled to ZiegenVine Homestead in the southern Finger Lakes region of New York. When we got to the farm, I knew that I would be happy doing anything in their beautiful surroundings. 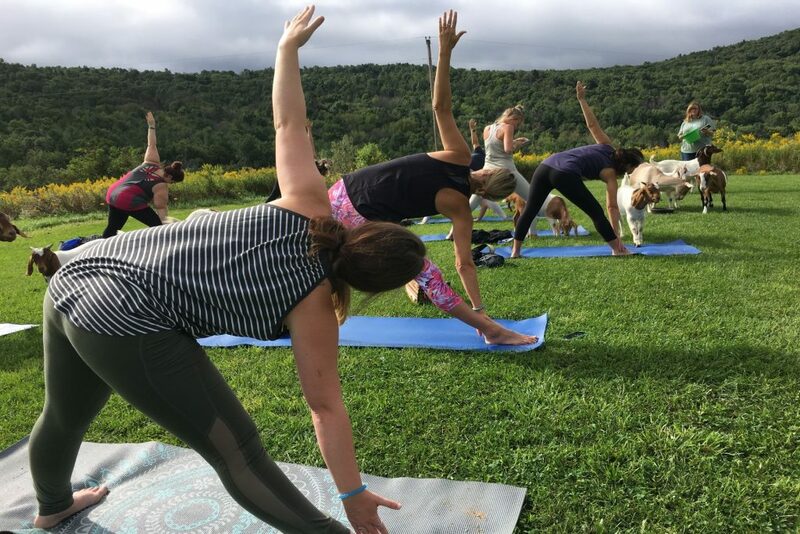 A historic barn hosts goat yoga on rainy days, but we were fortunate enough to get a break in the weather and do our yoga outside. The mowed lawn was surrounded by fields of goldenrod in bloom. From our perch atop the hill, we could see tree-covered hills rolling out in all directions. The goats followed us up to the clearing; this obviously wasn’t their first yoga class. It’s not goats doing yoga or a new goat pose yoga gurus are touting, goat yoga is simply doing regular yoga with goats. Some places have baby goat yoga, but at ZieganVine Homestead there were goats of all ages. When you see goat yoga videos or photos, there are often goats on people’s backs as they try to hold yoga postures. Often, someone is putting food there to encourage the goats to jump or climb on the participants. At ZiegenVine Homestead, the goats are ranging freely in the mowed lawn area. 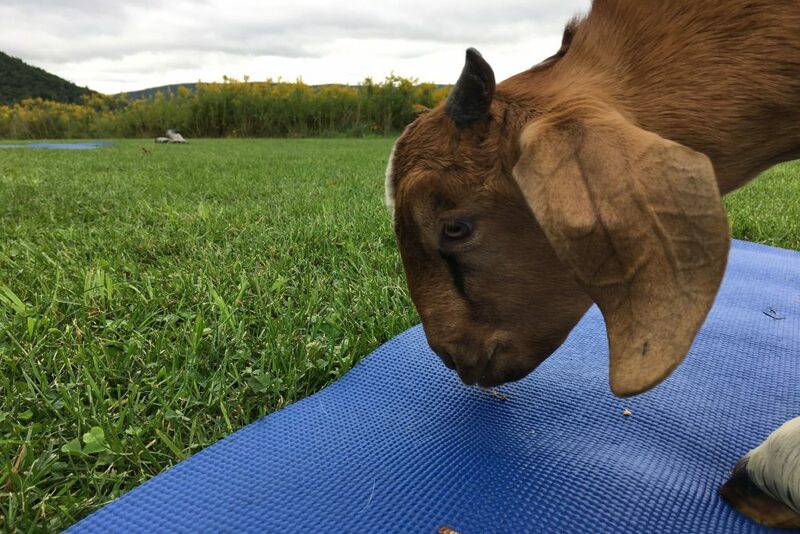 Allison Lavine, who owns the farm with her husband Randy Ziegenhagen, walks around dropping food on the yoga mats and cleaning up whatever the goats drop on the mats in return. 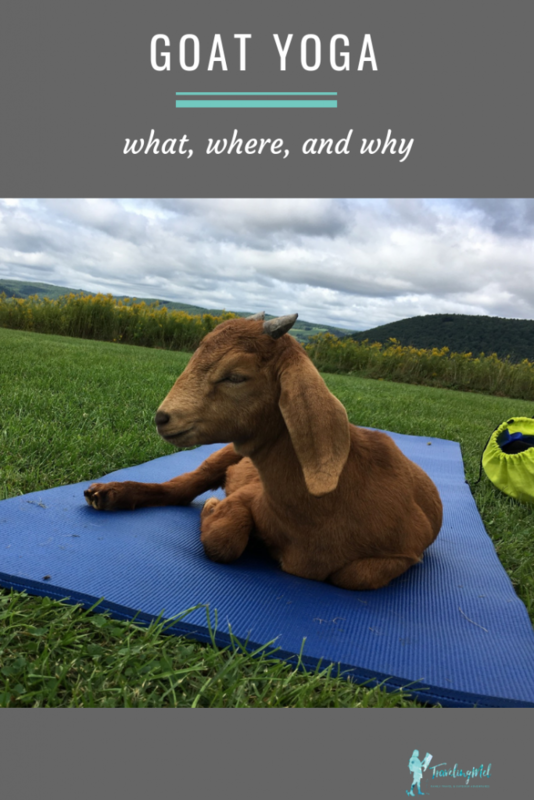 Why Do Yoga With Goats? 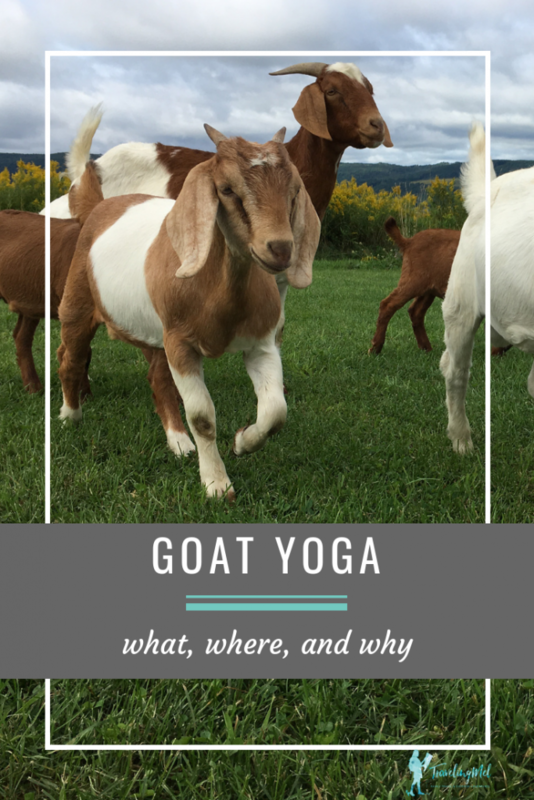 Are you asking yourself, “what’s the point of doing yoga with goats?” Basically, it’s fun. You probably aren’t going to Zen out like you might in a non-goat yoga class, but you might smile and laugh more. Fans of goat yoga, and there are a lot – many classes sell out, say doing yoga around goats helps us take ourselves less seriously. Our instructor, Elizabeth Moses, described goat yoga as a “weird mix of reverence and irreverence. Morse’s Oregon goat yoga is now “Original Goat Yoga.” She started it on her farm when someone who attended a kid’s birthday party suggested it. It grew like crazy and you can read all about it in this CNBC article. You can still do her goat yoga in Albany, Oregon as well as other locations around the state and country. I am also glad someone came up with this zany idea. I can’t imagine anyone uses this as a serious practice, but to add it to a “regular” practice is a lot of fun. It brings joy and the unexpected to yoga. While I wasn’t focused inward, I was “in the moment.” And I was snuggling with goats. Yes. With a caveat. They are livestock and they do step and jump on you. Levine told us that no one has ever gotten hurt in her goat yoga classes. The goats we did yoga with were really friendly, much like dogs. I’m sure there is some case somewhere where someone got hurt, but it isn’t any more dangerous than yoga on a paddleboard or visiting goats at a petting zoo. At ZiegenVine Homestead they leave the horns on the goats. Some places remove the horns. Since Levine’s goats live outside in the mountains, she hates to take away their opportunity to protect themselves should a predator stroll onto the farm. 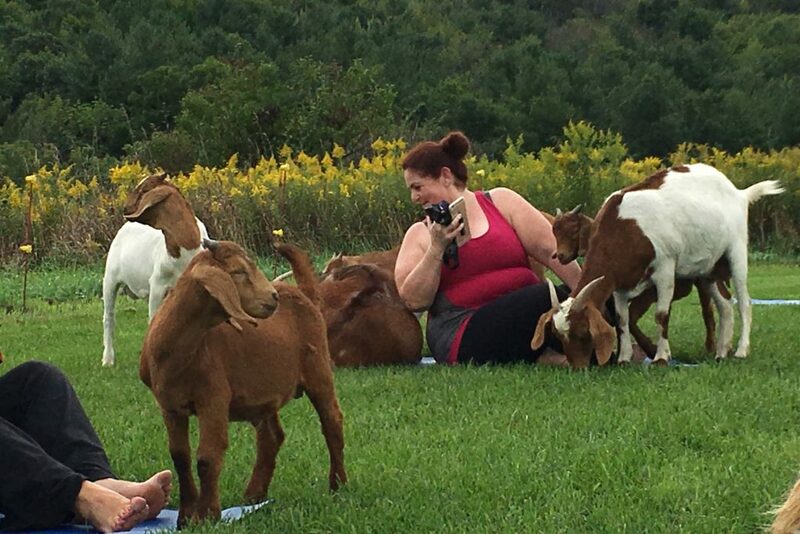 You can do yoga with goats all over the country now, so if you are about to madly Google “yoga with goats near me,” just read a little further. 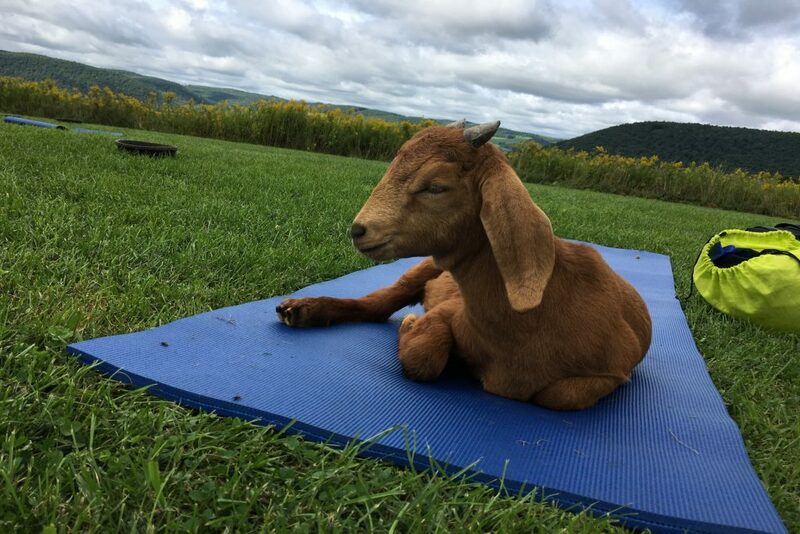 I loved my goat yoga class at ZiegenVine Homestead in Savona, New York. For goat yoga Oregon, try Original Goat Yoga. They also have classes in California, Illinois, Kentucky, New York, Michigan, Oregon, and Pennsylvania. Find their locations here. They even have goat yoga with wine (that seems like a little much, doesn’t it? Maybe just goats and wine would be enough). For goat yoga Arizona, try Arizona Goat Yoga. How Much Does Goat Yoga Cost? Like any yoga class, prices for a goat class vary depending where you go. I saw prices ranging from $12-$24 and heard rumors of them costing as much as $35. It’s not inexpensive, but the price of the class usually goes back to raising and caring for the goats. 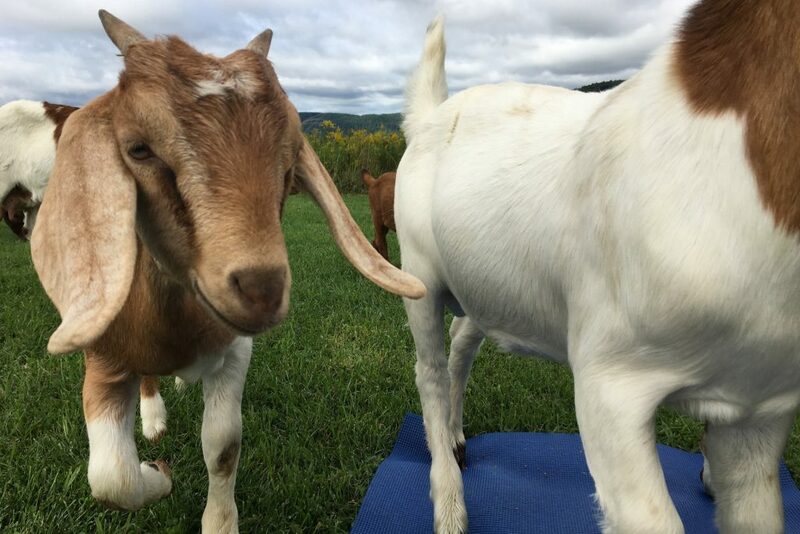 Can’t find a goat yoga class near you? Get a goat yoga shirt instead. Or wear one to your next class to show the goats how much you care. See other goat shirts on Amazon. 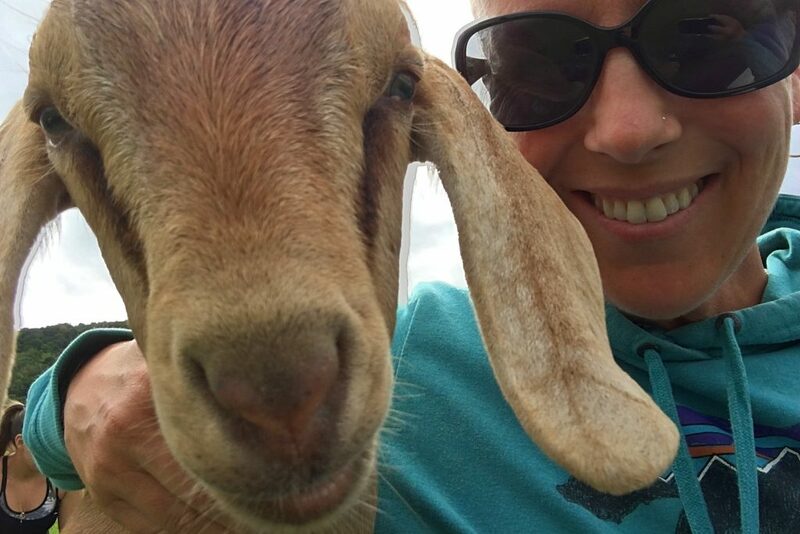 I will surely advice my wife to go through this blog as Goat yoga is the act of petting or being near goats will produce an automatic relaxation response. Thanks for Sharing. Just found your article! According to GoDaddy, Goat Yoga dot com has been around since 2015- (over a year before the “other” goat yoga’s websites)… so I am going with Arizona Goat Yoga in Gilbert to be the “First Goat Yoga”. Its a shame Arizona doesn’t get more credit. I have personally been to their Arizona Goat Yoga class in Gilbert and they are AMAZING and have over 100 people in each of their classes! So I agree, It probably is the Largest. I can see why you would be proud of your yoga company. It looks like a great organization! It’s nice that classes can be found around the country so lots of people can take part. Thank you for this great article. We are so happy you enjoyed your class on our farm. We hope you and your family have safe travels and would love to see you again! Best wishes! Thank you! I had a great time and do hope to get back!